The Mongol Empire (Mongolian: Их Монгол Улс, meaning "Great Mongol Nation;" (1206–1405) was the largest contiguous land empire in history, covering over 33 million km² at its peak, with an estimated population of over 100 million people. The Mongol Empire was founded by Genghis Khan in 1206, and at its height, encompassed the majority of territories from southeast Asia to central Europe. After unifying the Mongol–Turkic tribes, the Empire expanded via numerous conquests over continental Eurasia, beginning with the conquests of Western Xia in north China and the Khwarezmid Empire in Iran. Modern estimates suggest that 30 million or more people died during the Mongol conquests. During its existence, the Pax Mongolica facilitated cultural exchange and trade between the East, West, and the Middle East in the period of the thirteenth and fourteenth centuries. The Mongol Empire was ruled by the Khagan. After the death of Ogedei Khan, it split into four parts (Yuan Dynasty, Il-Khans, Chagatai Khanate, and Golden Horde), each of which was ruled by its own Khan. Descendants of the Mongols would also rule in India as the Moghuls, and in China through the Yuan Dynasty. The Mongols ruled with a strong sense of justice, summed up in their Yasa code and emphasized ability over lineage. The Mongol Empire brought peace, stability, and unity to large tracts of the known world and practiced religious tolerance to a remarkable degree at a time when conformity to religious doctrine was rigidly enforced in much of Europe. Genghis Khan was the founder of the Mongol Empire and Mongol Nation. One of the more successful tactics employed by the Mongols was to wipe out urban populations that had refused to surrender; in the invasion of Kievan Rus', almost all major cities were destroyed; but if they chose to submit, the people were spared and treated leniently. In addition to intimidation tactics, the rapid expansion of the Empire was facilitated by military hardiness (especially during bitterly cold winters), military skill, meritocracy, and discipline. Subotai, in particular, among the Mongol commanders, viewed winter as the best time for war—while less hardy people hid from the elements, the Mongols were able to use frozen lakes and rivers as highways for their horsemen, a strategy he used with great effect in Russia. The Mongol Empire had a lasting impact, unifying large regions, some of which (such as eastern and western Russia and the western parts of China) remain unified today, albeit under different leadership. The Mongols themselves were assimilated into local populations after the fall of the empire, and many of these descendants adopted local religions—for example, the western Khanates adopted Islam, largely under Sufi influence. 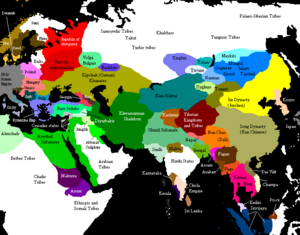 The influence of the Mongol Empire may prove to be even more directas scientists identify a Y-chromosomal lineage present in about 8 percent of the men in a large region of Asia (or about 0.5 percent of the men in the world). The paper suggests that the pattern of variation within the lineage is consistent with a hypothesis that it originated in Mongolia about 1,000 years ago. Such a spread would be too rapid to have occurred by diffusion, and must therefore be the result of selection. The scientists propose that the lineage is carried by likely male line descendants of Genghis Khan, and that it has spread through social selection. In addition to the Khanates and other descendants, the Mughal royal family of India also descended from Genghis Khan: Babur's mother was a descendant, whereas his father was directly descended from Timur (Tamerlane). At the time of Genghis Khan's death in 1227, the empire was divided among his four sons, with his third son as the supreme Khan. By the 1350s, the khanates were in a state of fracture and had lost the order brought to them by Genghis Khan. Eventually the separate khanates drifted away from each other, becoming the Il-Khans Dynasty based in Iran, the Chagatai Khanate in Central Asia, the Yuan Dynasty in China, and what would become the Golden Horde in present-day Russia. Eurasia on the eve of the Mongol invasions, c. 1200. Genghis Khan, through political manipulation and military might, united the nomadic, perpetually rivaled Mongol-Turkic tribes under his rule by 1206. He quickly came into conflict with the Jin empire of the Jurchen and the Western Xia in northern China. Under the provocation of the Muslim Khwarezmid Empire, he moved into Central Asia as well, devastating Transoxiana and eastern Persia, then raiding into Kievan Rus' (a predecessor state of Russia, Belarus, and Ukraine) and the Caucasus. While engaged in a final war against the Western Xia, Genghis fell ill and died. Before dying, Genghis Khan divided his empire among his sons and immediate family, but as custom made clear, it remained the joint property of the entire imperial family who, along with the Mongol aristocracy, constituted the ruling class. 1206: By this year, Temujin from the Orkhon Valley dominated Mongolia and received the title Genghis Khan, thought to mean "Oceanic Ruler" or "Firm, Resolute Ruler"
1207: The Mongols began operations against the Western Xia, which comprised much of northwestern China and parts of Tibet. This campaign lasted until 1210 with the Western Xia ruler submitting to Genghis Khan. During this period, the Uyghur Turks also submitted peacefully to the Mongols and became valued administrators throughout the empire. 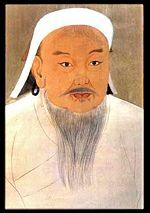 1211: After a great quriltai, or meeting, Genghis Khan led his armies against the Jin Dynasty, which ruled northern China. 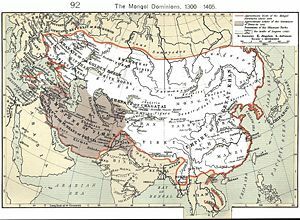 1218: The Mongols capture Semirechye and the Tarim Basin, occupying Kashgar. 1218: The execution of Mongol envoys by the Khwarezmian Shah Muhammad sets in motion the first Mongol westward thrust. 1219: The Mongols cross the Jaxartes (Syr Darya) and begin their invasion of Transoxiana. 1219–1221: While the campaign in northern China was still in progress, the Mongols waged a war in central Asia and destroyed the Khwarezmid Empire. One notable feature was that the campaign was launched from several directions at once. In addition, it was notable for special units assigned by Genghis Khan personally to find and kill Ala al-Din Muhammad II, the Khwarazmshah who fled from them, and ultimately ended up hiding on an island in the Caspian Sea. 1223: The Mongols gain a decisive victory at the Battle of the Kalka River, the first engagement between the Mongols and the East Slavic warriors. 1226: Invasion of the Western Xia, being the second battle with the Western Xia. 1237: Under the leadership of Batu Khan, the Mongols return to the West and begin their campaign to subjugate Kievan Rus'. The Mongol-Turkic military organization was simple, but effective. It was based on an old tradition of the steppe, which was a decimal system known in Iranian cultures since Achaemenid Persia: The army was built up from squads of ten men each, called an arban; ten arbans constituted a company of a hundred, called a jaghun; ten jaghuns made a regiment of a thousand, called mingghan; and ten mingghans would then constitute a regiment of ten thousand (tumen), which is the equivalent of a modern division. Unlike other mobile fighters, such as the Huns or the Vikings, the Mongols were very comfortable in the art of the siege. They were very careful to recruit artisans from the cities they plundered, and along with a group of experienced Chinese engineers, they were experts in building the trebuchet and other siege machines, mostly built on the spot using nearby trees. During battle, Mongol forces used extensive coordination of combined arms forces. Though they were famous for their horse archers, their lance forces were equally skilled and just as essential to their success. Mongol forces also used their engineers in battle. They used siege engines and rockets to disrupt enemy formations, confused combatant forces with smoke by isolating portions of an enemy army in order to prevent allies from sending aid while that enemy force is destroyed. The army's discipline distinguished Mongol soldiers from their peers. The forces under the command of the Mongol Empire were generally trained, organized, and equipped for mobility and speed. To maximize mobility, Mongol soldiers were relatively lightly armored compared to many of the armies they faced. In addition, soldiers of the Mongol army functioned independently of supply lines, considerably speeding up army movement. Skillful use of couriers enabled these armies to maintain contact with each other and with their higher leaders. Discipline was inculcated in nerge (traditional hunts), as reported by Persian historian Juvayni (1226 – 1283). These hunts were distinct from hunts in other cultures which were the equivalent to small unit actions. Mongol forces would spread out on line, surrounding an entire region and drive all of the game within that area together. The goal was to let none of the animals escape and to slaughter them all. All military campaigns were preceded by careful planning, reconnaissance, and gathering of sensitive information relating to the enemy territories and forces. The success, organization, and mobility of the Mongol armies permitted them to fight on several fronts at once. All males aged 15 to 60 and capable of undergoing rigorous training were eligible for conscription into the army, and was a source of honor in the tribal warrior tradition. Another advantage of the Mongols was their ability to traverse large distances even during harsh, cold winters; in particular, frozen rivers led them like highways to large urban conurbations on their banks. In addition to siege engineering, the Mongols were also adept at river-work, crossing the river Sajó in spring flood conditions with thirty thousand cavalry in a single night during the battle of Mohi (April, 1241), defeating the Hungarian king Bela IV. Similarly, in the attack against the Muslim Khwarezmshah, a flotilla of barges was used to prevent escape on the river. The Mongol Empire was governed by a code of law devised by Genghis, called Yasa, meaning "order" or "decree." A particular canon of this code was that the nobility shared much of the same hardship as the common man. It also imposed severe penalties, for example, the death penalty was decreed if the mounted soldier following another did not pick up something dropped from the mount in front. At the same time, meritocracy prevailed, and Subutai, one of the most successful Mongol generals, started life as a blacksmith's son. On the whole, the tight discipline made the Mongol Empire extremely safe and well-run; European travelers were amazed by the organization and strict discipline of the people within the Mongol Empire. Under Yasa, chiefs and generals were selected based on merit, religious tolerance was guaranteed, and thievery and vandalizing of civilian property was strictly forbidden. According to legend, a woman carrying a sack of gold could travel safely from one end of the Empire to another. The empire was governed by a non-democratic parliamentary-style central assembly, called Kurultai, in which the Mongol chiefs met with the Great Khan to discuss domestic and foreign policies. Genghis also demonstrated a rather liberal and tolerant attitude to the beliefs of others, and never persecuted people on religious grounds. This proved to be good military strategy, as when he was at war with Sultan Muhammad of Khwarezm, other Islamic leaders did not join the fight against Genghis—it was instead seen as a non-holy war between two individuals. Throughout the empire, trade routes and an extensive postal system (yam) were created. Many merchants, messengers, and travelers from China, the Middle East, and Europe used the system. Genghis Khan also created a national seal, encouraged the use of a written alphabet in Mongolia, and exempted teachers, lawyers, and artists from taxes, although taxes were heavy on all other subjects of the empire. At the same time, any resistance to Mongol rule was met with massive collective punishment. Cities were destroyed and their inhabitants slaughtered if they defied Mongol orders. Mongols prized their commercial and trade relationships with neighboring economies and they continued this policy during the process of their conquests and during the expansion of their empire. For all merchants and ambassadors having proper documentation and authorization, traveling through their realms were protected. This greatly increased overland trade. During the thirteenth and early fourteenth centuries, European merchants, numbering in the hundreds, perhaps thousands, made their way from Europe to the distant land of China—Marco Polo is only one of the best known of these. Well-traveled and relatively well-maintained roads linked lands from the Mediterranean basin to China. The Mongol Empire had negligible influence on seaborne trade. At first, the Mongol Empire was ruled by Ogedei Khan, Genghis Khan's third son and designated heir, but after his death in 1241, the fractures which would ultimately crack the Empire began to show. 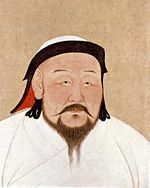 Enmity between the grandchildren of Genghis Khan resulted in a five year regency by Ogedei's widow until she finally got her son, Guyuk Khan, confirmed as Great Khan. But he only ruled two years, and following his death—he was on his way to confront his cousin Batu Khan, who had never accepted his authority—another regency followed, until finally a period of stability came with the reign of Monke Khan, from 1251-1259. The last universally accepted Great Khan was his brother Kublai Khan, from 1260-1294. Despite his recognition as Great Khan, he was unable to keep his brother Hulagu and their cousin Berke from open warfare in 1263, and after Kublai's death, there was not an accepted Great Khan, so the Mongol Empire was fragmented for good. Genghis Khan divided the empire into four Khanates, sub-rules, but as a single empire under the Great Khan (Khan of Khans). The following Khanates emerged since the regency following Ogedei Khan's death, functioning independently, but under the oversight of the Great Khan. After the death of Kublai Khan, the Khanates fractured permanently. Blue Horde (under Batu Khan) and White Horde (under Orda Khan) would soon be combined into the Golden Horde, with Batu Khan emerging as Khan. The empire's expansion continued for a generation or more after Genghis Khan's death in 1227. Under Genghis's successor, Ögedei Khan, the speed of expansion reached its peak. Mongol armies pushed into Persia, finished off the Xia and the remnants of the Khwarezmids, and came into conflict with the Song Dynasty of China, starting a war that would last until 1279, and concluding with the Mongols' successful conquest of populous China, which constituted then the majority of the world's economic production. Then, in the late 1230s, the Mongols under Batu Khan invaded Russia and Volga Bulgaria, reducing most of its principalities to vassalage, and pressed on into Eastern Europe. In 1241 the Mongols may have been ready to invade western Europe as well, having defeated the last Polish-German and Hungarian armies at the Battle of Legnica and the Battle of Mohi. Batu Khan and Subutai were preparing to invade western Europe, starting with a winter campaign against Austria and Germany, and finishing with Italy. However news of Ögedei's death prevented any invasion, as Batu had to turn his attentions to the election of the next great Khan. It is often speculated that this was one of the great turning points in history and that Europe may well have fallen to the Mongols had the invasion gone ahead. During the 1250s, Genghis's grandson, Hulegu Khan, operating from the Mongol base in Persia, destroyed the Abbasid Caliphate in Baghdad and destroyed the cult of the Assassins, moving into Palestine, towards Egypt. The Great Khan Möngke having died, however, he hastened to return for the election, and the force that remained in Palestine was destroyed by the Mamluks under Baibars, in 1261, at Ayn Jalut. When Genghis Khan died, a major potential weakness of the system he had set up manifested itself. It took many months to summon the kurultai, as many of its most important members were leading military campaigns thousands of miles from the Mongol heartland. And then it took months more for the kurultai to come to the decision that had been almost inevitable from the start—that Genghis's choice as successor, his third son Ögedei, should become Great Khan. Ogedei was a rather passive ruler and personally self-indulgent, but he was intelligent, charming, and a good decision-maker whose authority was respected throughout his reign by apparently stronger-willed relatives and generals whom he had inherited from Genghis. On Ögedei's death in 1241, however, the system started falling apart. Pending a kurultai to elect Ögedei's successor, his widow Toregene Khatun assumed power and proceeded to ensure the election of her son, Guyuk, by the kurultai. Batu was unwilling to accept Guyuk as Great Khan, but lacked the influence in the kurultai to procure his own election. Therefore, while moving no further west, he simultaneously insisted that the situation in Europe was too precarious for him to come east and that he could not accept the result of any kurultai held in his absence. The resulting stalemate lasted four years. In 1246, Batu eventually agreed to send a representative to the kurultai but never acknowledged the resulting election of Guyuk as Great Khan. Guyuk died in 1248, only two years after his election, on his way west, apparently to force Batu to acknowledge his authority, and his widow Oghul Ghaymish assumed the regency pending the meeting of the kurultai; unfortunately for her, she could not maintain the power. Batu remained in the west but this time gave his support to his and Guyuk's cousin, Möngke, who was duly elected Great Khan in 1251. 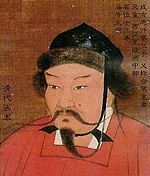 Möngke Khan unwittingly provided his brother Kublai with a chance to become Khan in 1260, assigning Kublai to a province in North China. Kublai expanded the Mongol empire and became a favorite of Möngke. Kublai's conquest of China is estimated by Holworth, based on census figures, to have killed over 18 million people. Later, though, when Kublai began to adopt many Chinese laws and customs, his brother was persuaded by his advisers that Kublai was becoming too Chinese and would become treasonous. Möngke kept a closer watch on Kublai from then on but died campaigning in the west. After his older brother's death, Kublai placed himself in the running for a new khan against his younger brother, and, although his younger brother won the election, Kublai defeated him in battle, and Kublai became the last true Great Khan. He proved to be a strong warrior, but his critics still accused him of being too closely tied to Chinese culture. When he moved his headquarters to Beijing, there was an uprising in the old capital that he barely staunched. He focused mostly on foreign alliances, and opened trade routes. He dined with a large court every day, and met with many ambassadors, foreign merchants, and even offered to convert to Christianity if this religion was proved to be correct by 100 priests. By the reign of Kublai Khan, the empire was already in the process of splitting into a number of smaller khanates. After Kublai died in 1294, his heirs failed to maintain the Pax Mongolica, and the Silk Road closed. Inter-family rivalry—compounded by the complicated politics of succession, which twice paralyzed military operations as far off as Hungary and the borders of Egypt (crippling their chances of success)—and the tendencies of some of the khans to drink themselves to death fairly young (causing the aforementioned succession crises), hastened the disintegration of the empire. Another factor which contributed to the disintegration was the decline of morale when the capital was moved from Karakorum to modern day Beijing by Kublai Khan, because Kublai Khan associated more with Chinese culture. Kublai concentrated on the war with the Song Dynasty, assuming the mantle of ruler of China, while the more Western khanates gradually drifted away. The four descendant empires were the Mongol-founded Yuan Dynasty in China, the Chagatai Khanate, the Golden Horde that controlled Central Asia and Russia, and the Ilkhans who ruled Persia from 1256 to 1353. Of the latter, their ruler Ilkhan Ghazan converted to Islam in 1295 and actively supported the expansion of this religion in his empire. The Mongol expansion throughout the Asia, from around 1215 to 1360, helped bring political stability and re-establish the Silk Road vis-à-vis Karakorum. With rare exceptions, such as Marco Polo or such Christian ambassadors as William of Rubruck, few Europeans traveled the entire length of the Silk Road. Instead traders moved products much like a bucket brigade, with luxury goods being traded from one middleman to another, from China to the West, and resulting in extravagant prices for the trade goods. The disintegration of the Mongol Empire led to the collapse of the Silk Road's political, cultural, and economic unity. Turkic tribes seized the western end of the Silk Road from the decaying Byzantine Empire, and sowed the seeds of a Turkic culture that would later crystallize into the Ottoman Empire under the Sunni faith. Turkic-Mongol military bands in Iran, after some years of chaos, were united under the Saffavid tribe, the modern Iranian nation taking shape under the Shiite faith. Meanwhile Mongol princes in Central Asia were content with Sunni orthodoxy with decentralized princedoms of the Chagatay, Timurid, and Uzbek houses. In the Kypchak-Tatar zone, Mongol khanates all but crumbled under the assaults of the Black Death and the rising power of Muscovy. On the east end, the Chinese Ming Dynasty overthrew the Mongol yoke and pursued a policy of economic isolationism. Yet another force, the Kalmyk-Oyrats, pushed out of the Baikal area in central Siberia, but failed to have much impact beyond Turkestan. Some Kalmyk tribes did manage to migrate into the Volga-North Caucasus region, but their impact was limited. After the Mongol Empire, the great political powers along the Silk Road became economically and culturally separated. Accompanying the crystallization of regional states was the decline of nomad power, partly due to the devastation of the Black Death and partly due to the encroachment of sedentary civilizations equipped with gunpowder. Ironically, the effect of gunpowder and early modernity on Europe was the integration of territorial states and increasing mercantilism. However along the Silk Road, it was quite the opposite: failure to maintain the level of integration of the Mongol Empire and decline in trade, partly due to European maritime trade. The Silk Road stopped serving as a shipping route for silk around 1400. The Mongol Empire was the largest contiguous empire in human history. The thirteenth and fourteenth centuries, when the empire came to power, are often called the "Age of the Mongols." The Mongol armies during that time were extremely well organized. The death toll (by battle, massacre, flooding, and famine) of the Mongol wars of conquest is placed as high as 40 million by some sources. Non-military achievements of the Mongol Empire include the introduction of a writing system, based on the Uyghur script, still used in Inner Mongolia. The Empire unified all the tribes of Mongolia, which made possible the emergence of a Mongol nation and culture. Modern Mongolians are generally proud of the empire and the sense of identity that it gave to them. The Mongol empire is traditionally given credit for reuniting China and expanding its frontiers. 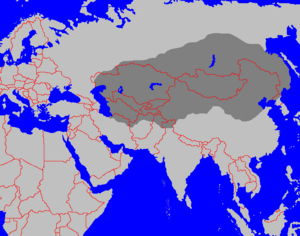 The language Chagatai, widely spoken among a group of Turks, is named after a son of Genghis Khan. It was once widely spoken, and had a literature, but was since eliminated in Russia. Moscow rose to prominence during the Mongol-Tatar yoke, some time after Russian rulers were accorded the status of tax collectors for Mongols (which meant that the Mongols themselves would rarely visit the lands that they owned). The Russian ruler Ivan III overthrew the Mongols completely to form the Russian Tsardom, after the Great standing on the Ugra River proved the Mongols vulnerable, and led to the independence of the Grand Duke of Moscow. It is worth noting, however, that Russian historians have for centuries viewed the Mongol occupation as a period of arrested development for Russia, and the primary reason for its backwardness in the following centuries compared to the rest of Europe. Europe’s knowledge of the known world was immensely expanded by the information brought back by ambassadors and merchants. When Columbus sailed in 1492, his missions were to reach Cathay, the land of Genghis Khan. Some research studies indicate that the Black Death, which devastated Europe in the late 1340s, may have reached from China to Europe along the trade routes of the Mongol Empire. Among the Western accounts, historian R. J. Rummel estimated that 30 million people were killed under the rule of the Mongol Empire, and the population of China fell by half in fifty years of Mongol rule. David Nicole states in The Mongol Warlords, "terror and mass extermination of anyone opposing them was a well-tested Mongol tactic." ↑ Zerjal, Xue, Bertolle, Wells, Bao, Zhu, Qamar, Ayub, Mohyuddin, Fu, Li, Yuldasheva, Ruzibakiev, Xu, Shu, Du, Yang, Hurles, Robinson, Gerelsaikhan, Dashnyam, Mehdi, Tyler-Smith (2003). "The Genetic Legacy of the Mongols." American Journal of Human Genetics (72): 717–721. ↑ Twentieth Century Atlas, Historical Body Count. Retrieved October 3, 2007. Howorth, Henry H. History of the Mongols from the 9th to the 19th Century: Part I: The Mongols Proper and the Kalmuks. New York: Burt Frankin, 1965. All links retrieved October 18, 2018. This page was last modified on 18 October 2018, at 16:40.